A heavy glass vial conceals an amber formula of very strong fragrance. It has been designed for mature hair which needs repair, moisture, strength and improved condition. The basic ingredients of Pure Care Dry Oil Restorative Treatment are: an Anatolian pomegranate seed oil which offers strong rejuvenating properties, and six extra natural oils. Sadly, it also contains several silicones and clogging mineral oil. Light formula and practical dispenser increase its efficiency and facilitate the application. Special hair protection doesn’t require shockingly expensive cosmetics because the best protective substances are natural oils. Dove knows it perfectly well, therefore it is launching more and more oil-based hair products. Anatolian pomegranate seed oil for mature hair has such oil formula. We can say a lot of things about the ingredients of the product but we cannot call it 100% natural. However, Dove Pure Care Dry Oil Restorative Treatment contains as many as six natural oils and extra ingredients which are beneficial to mature hair. Unfortunately, the product also includes silicones, fragrance substances and mineral oils which may overburden the hair. What are the substances included in Pure Care Dry Oil? 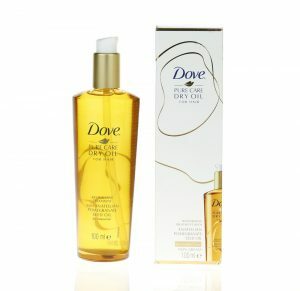 The variety of oils in Dove Pure Care Dry Oil Restorative Treatment with Anatolian Pomegranate Seed Oil transfers to the complex action. Pomegranate seed oil is the source of omega-5 punicic acid and other unsaturated fatty acids which offer anti-ageing properties. As a result, Dove oil for mature hair hinders ageing processes, strengthens and regenerates to prevent hair loss or brittleness. 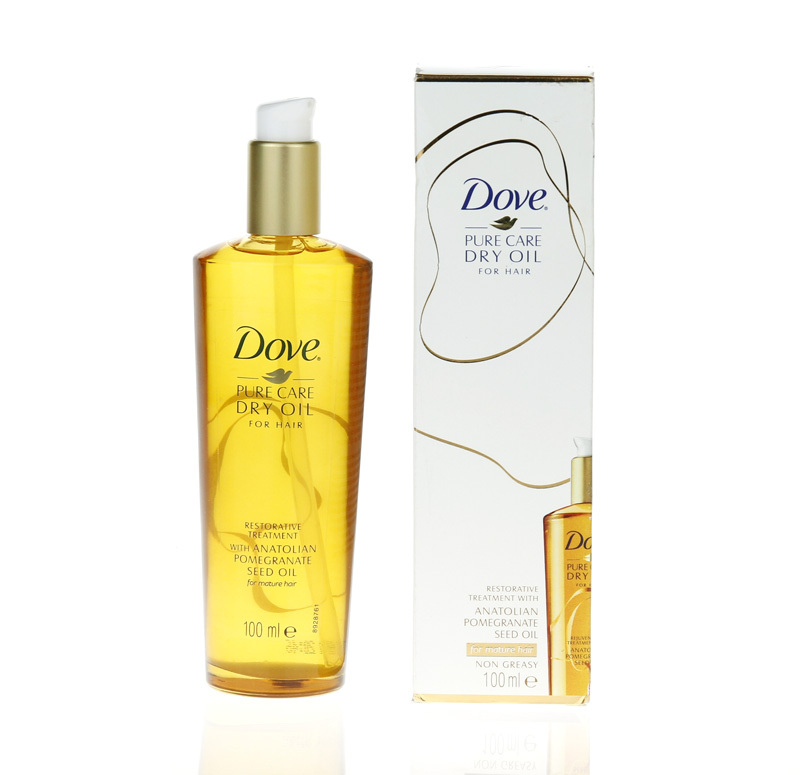 The rest of the oils in Dove Pure Care Dry Oil support the performance of pomegranate oil. Coconut oil locks in proper moisture. Sweet almond oil repairs, strengthens and keeps hair hydrated. Sunflower oil prevents frizz; palm oil moisturises and rebuilds whereas macadamia oil controls sebum production, which prevents greasy hair. Pure Care Dry Oil Restorative Treatment softens the strands and adds shine. Dove Pure Care Dry oil has a very interesting formula. It has a beautiful amber colour which looks really slickly in a glass vial. It doesn’t have a typical oily and heavy consistency. It can be defined as a light, non-overburdening product. On the other hand, a strong fragrance may be appealing or not – it depends whether you like strong scents on your hair. Application of the products should run smoothly. The pump is very useful and doses perfect portions of the oil. Dove Restorative Treatment can be used in three ways: thirty minutes before washing; after washing to lock in moisture; to enrich other cosmetics. The oil comes in a heavy glass bottle which is a big disadvantage – it is quite slippery and you can drop it easily.